Morehshin Allahyari’s digital animations explore various dark goddesses—monstrous and jinn female figures—from Middle Eastern mythologies. Zach Blas invents an amorphous mask as one way to avoid being surveilled by facial recognition techniques, and considers its function in relationship to masks used by those engaged in resistance movements. 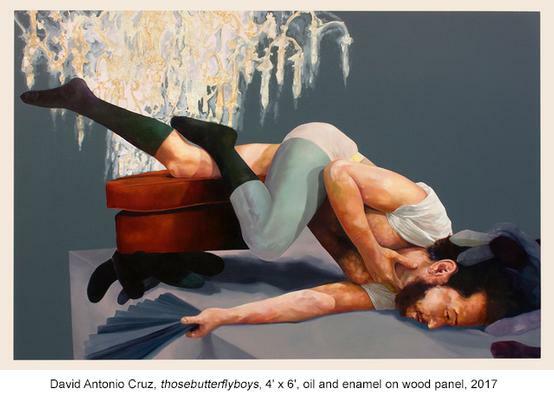 David Antonio Cruz’s paintings of black and brown queer bodies—solo and in couples—are informed by issues on visibility and camp theatricality. For the 3D-printed masks in Stranger Visions, Heather Dewey-Hagborg collected random items from public places in New York City and imagined the facial characteristics of their prior owners based on genomic research and DNA analysis. Amaryllis DeJesus Moleski’s futuristic paintings feature fanciful visualizations of mythological femme figures in quasi-narrative situations informed by queer and of-color communities. Hrvoje Slovenc’s portrait project of men from one village reveals the personal toll of Croatia’s troubled past. In the 1990s, the digital sphere opened up new avenues for displaying and projecting complex identities. Virtual platforms provided a space for invention and experimentation—for creating imagined identities. One’s constructed persona—mutable and virtual—became accessible to wider audiences. This freedom of invention would also lead to fragmentation and segmentation with the virtual self, inserting itself into real-life struggles, fantasies of escape, and sexual desires. By the 2000s, while some artists embraced these new worlds of constructed personas, others became even more committed to representing the realities of everyday life by amplifying notions of the authentic self through the conventions of portraiture, a genre that prioritizes the likeness of a person as an expression of their interiority. Since its beginnings in the 1980s, Bronx River Art Center’s exhibitions have featured work by artists who question various socially-embedded stereotypes and reject limited notions of race, gender, and sexuality. Persona: Presenting Authentic, Necessary, and Constructed Selves continues this commitment, visually navigating the new vulnerabilities faced by individuals at a time when social and media environments as well as new technologies, have become ever more influential. Persona is the first of five exhibits that will take place during the art center’s inaugural year in its restored building, after an eight-year hiatus for its renovation. Collectively titled “Waypoints: Platforms for Renewal,” the series of exhibitions are designed to bring core questions for the Bronx River Art Center into being by accessing nodes along its past trajectory. The intent is to situate the organization’s relationship to place-making and community building into a model for the future that reflects upon its development over three decades. Additional curators in the series include: BRAC’s current Executive Director, Gail Nathan, and two past Gallery Directors, Jose Ruiz and Chad Stayrook. BRAC’s next Gallery Director will curate a final exhibit in the series. This program is made possible with support from the National Endowments of the Arts, ArtWorks, the NYC Department of Cultural Affairs in partnership with the City Council, the NYS Council on the Arts with support from Governor Andrew Cuomo and the NYS Legislature. Additional support is from Bronx Borough President Ruben Diaz, Jr., Councilman Ritchie Torres and the Bronx Delegation, as well as private donors.